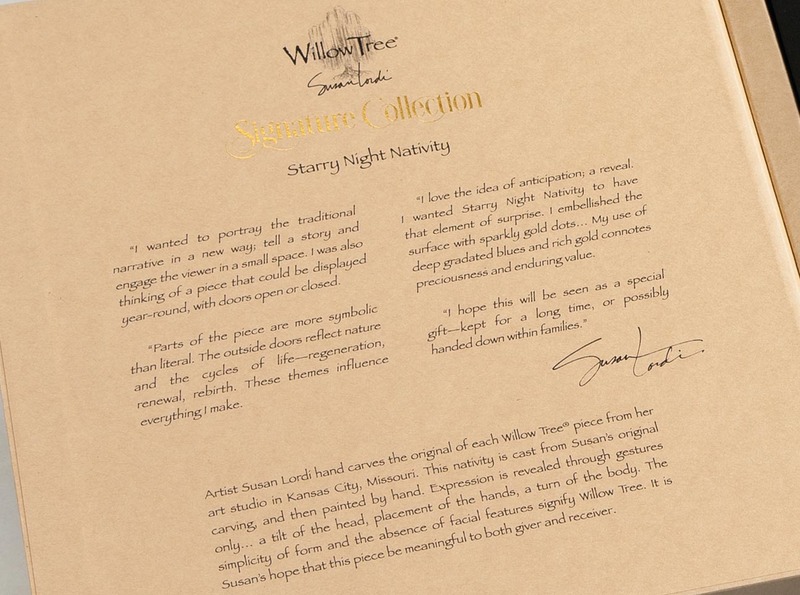 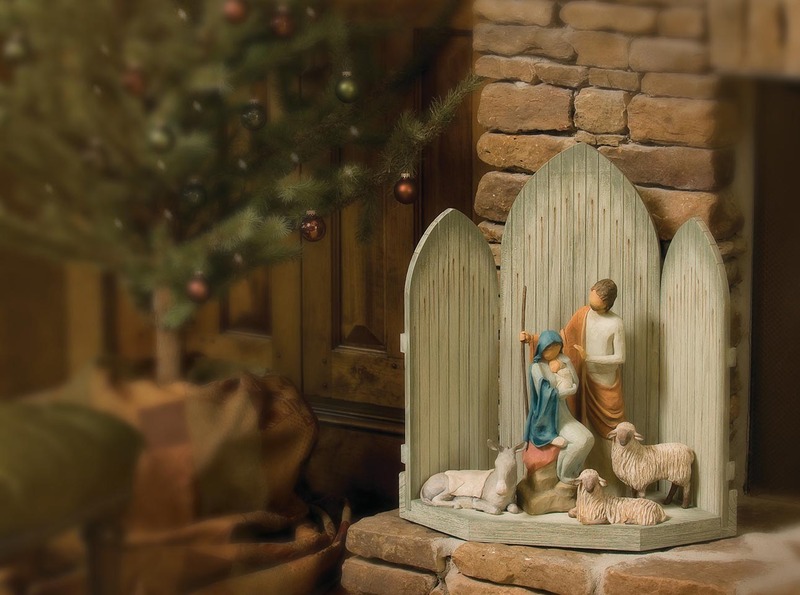 As enduring as the story it portrays, the Willow Tree Nativity collection is as loved today as when it was originally introduced in 2000. 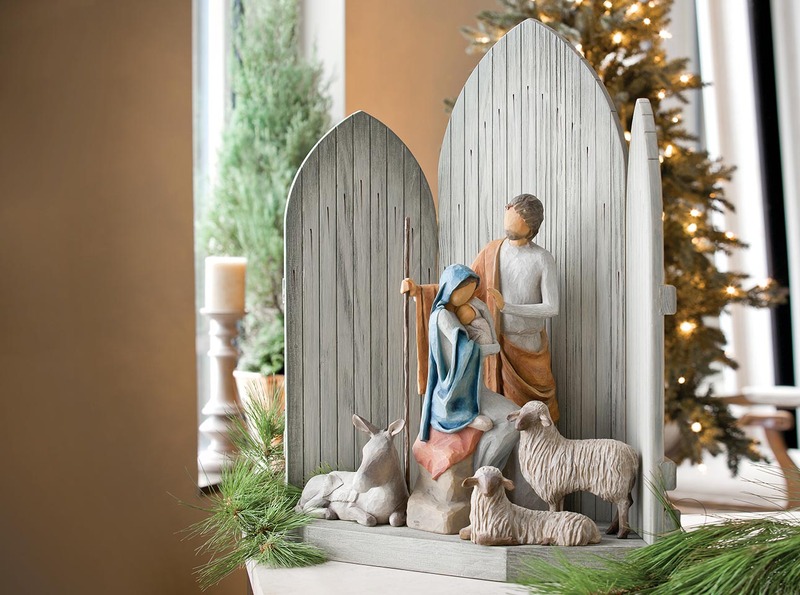 Its simplicity and form has made it a timeless classic. 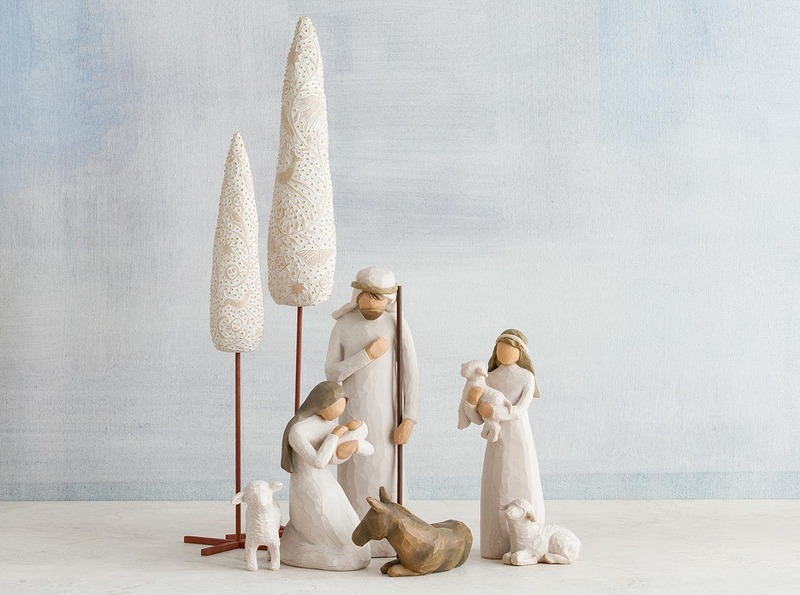 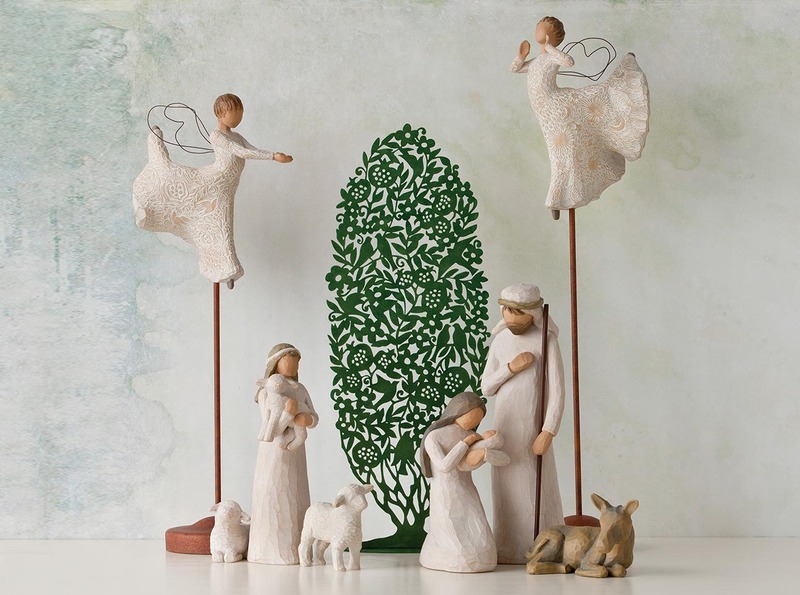 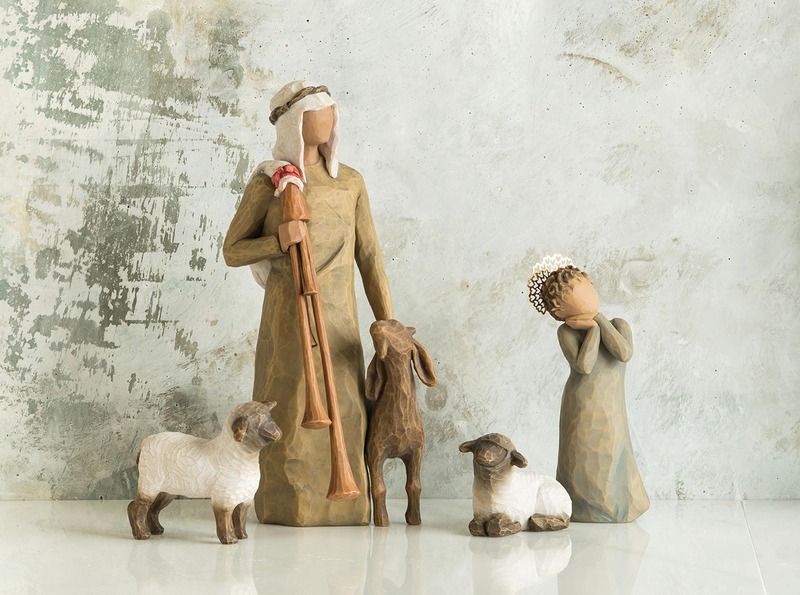 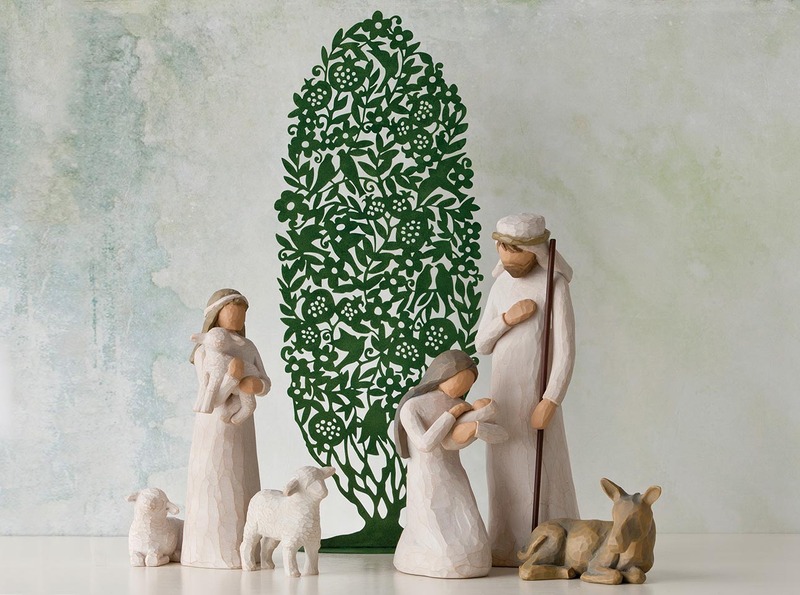 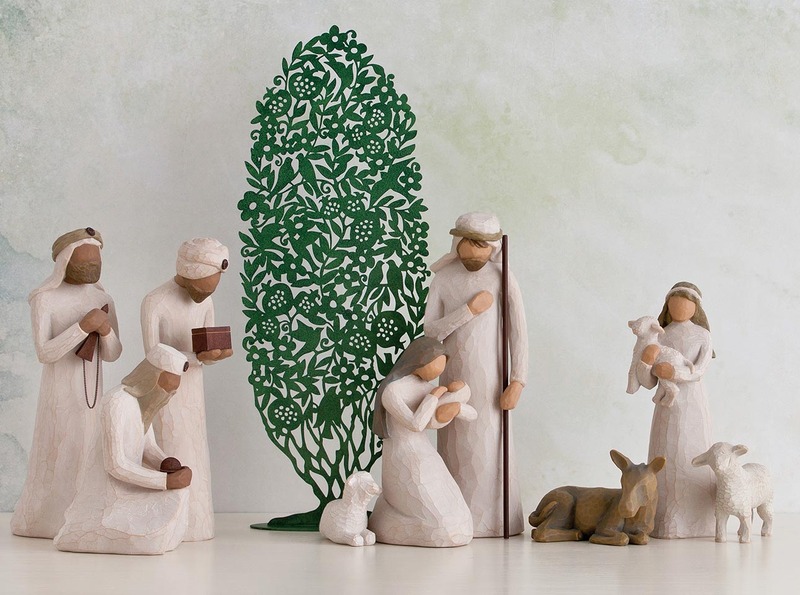 As a Christmas gift, wedding gift or self-purchase, the Willow Tree Nativity continues on as a family tradition. 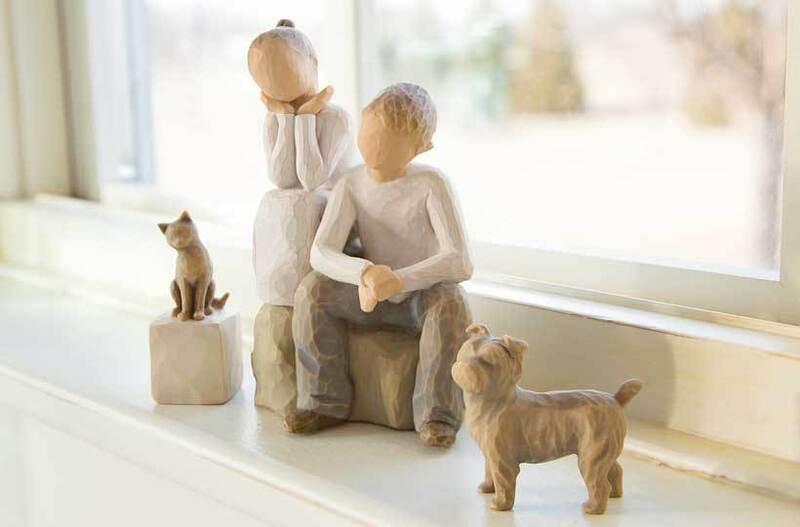 Each carved animal has a distinct personality! 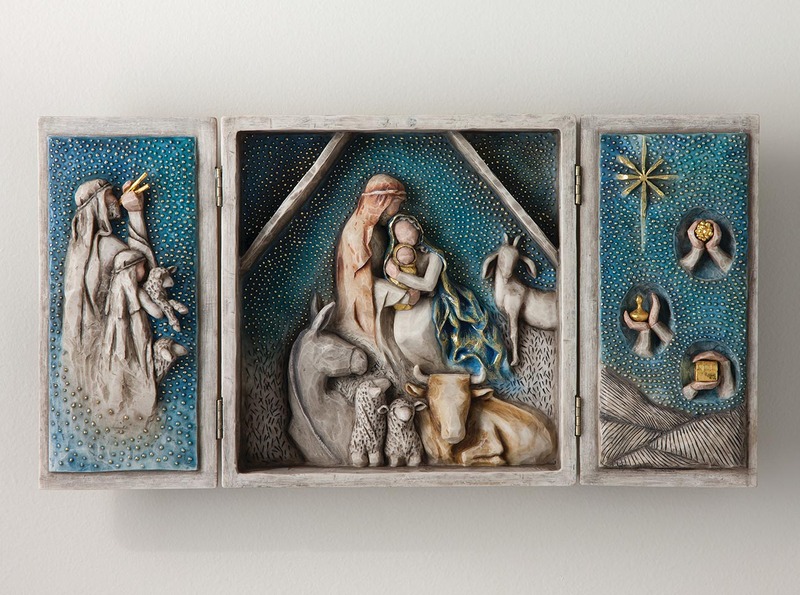 Starry Night Nativity is a traditional narrative, told in a new way. 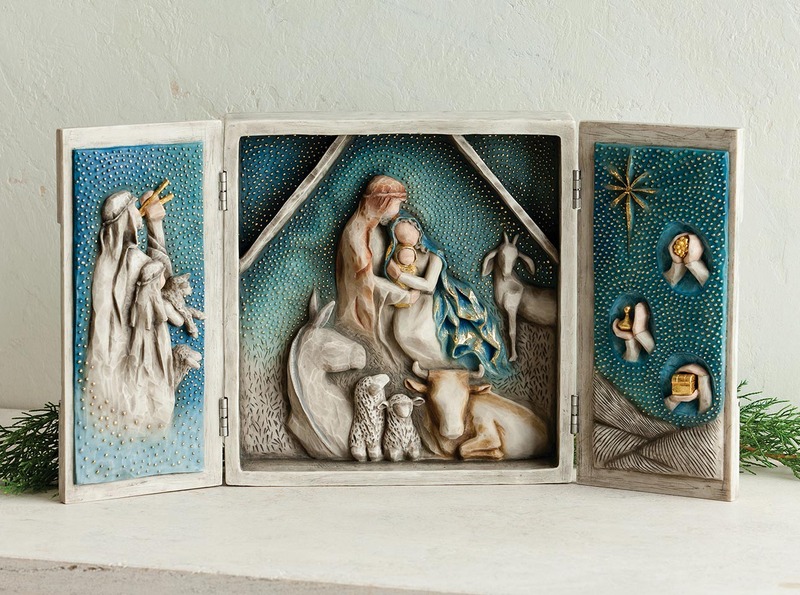 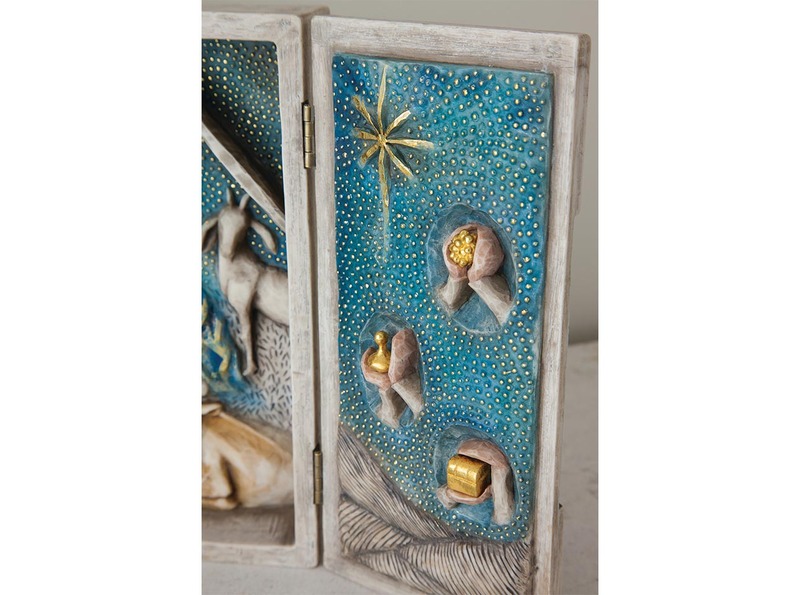 Nativity figures are carved in bas-relief within an 8” box that opens as a triptych to reveal a deep blue starry night embellished with twinkling gold dots encircling an intimate scene. 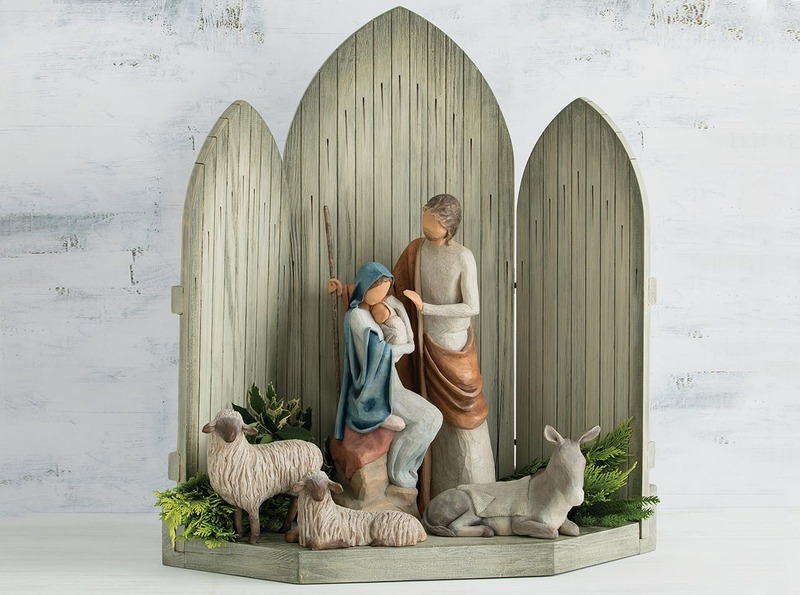 The Holy Family collection is ideal for those looking for a smaller nativity option. 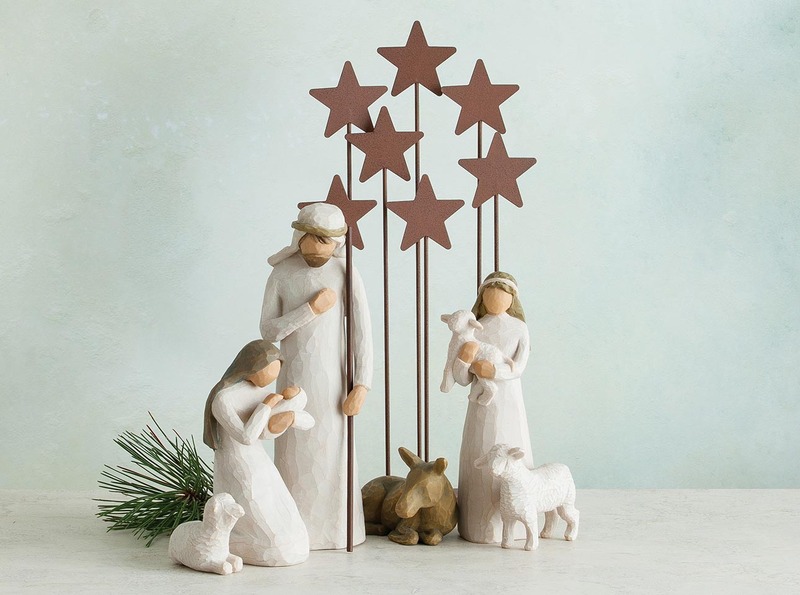 The 7.5”h figures are complemented by a backdrop of pierced curved metal, suggestive of twinkling stars. 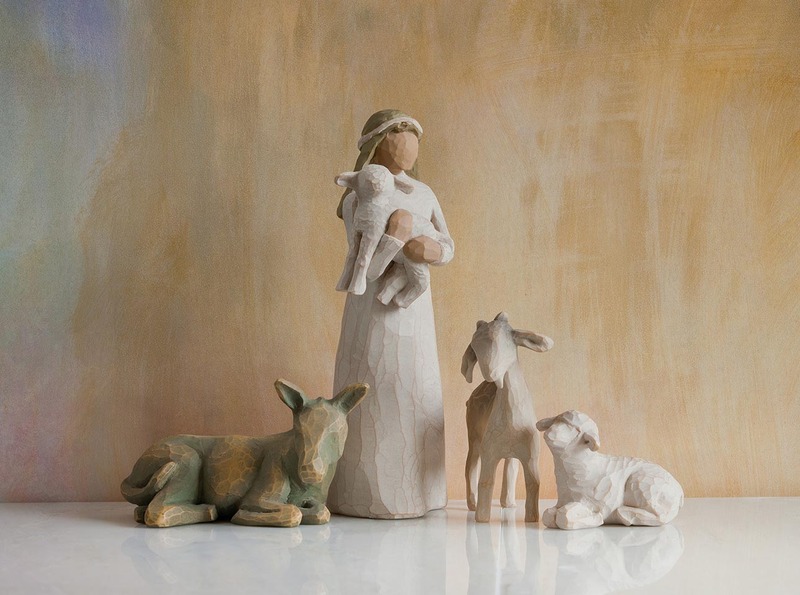 Four animals give watch, warmth and protection. 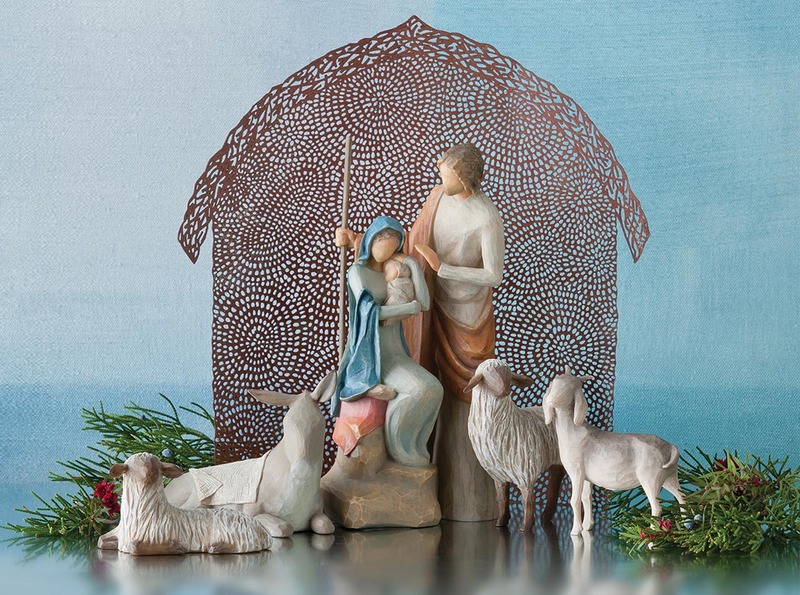 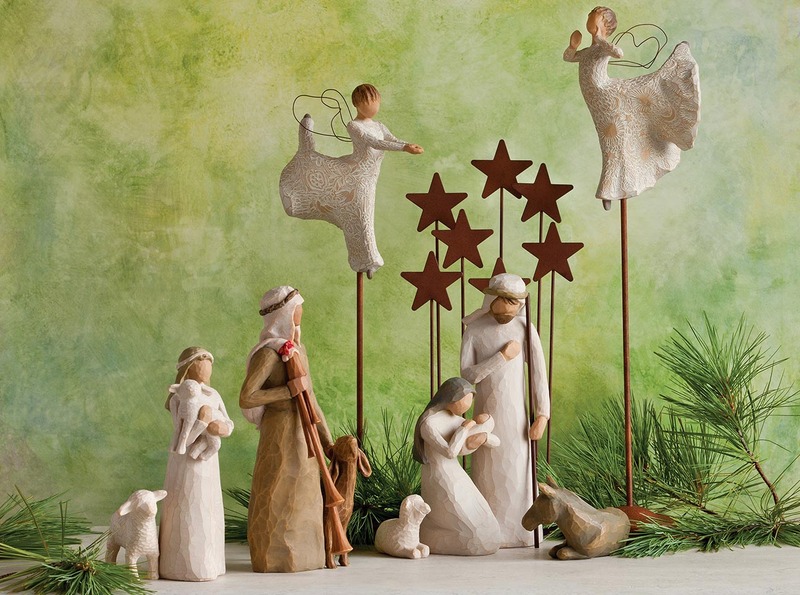 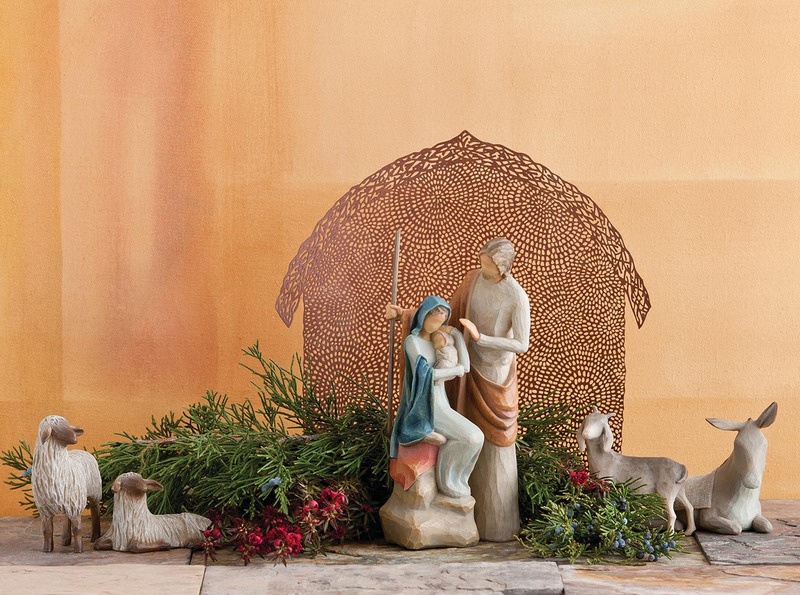 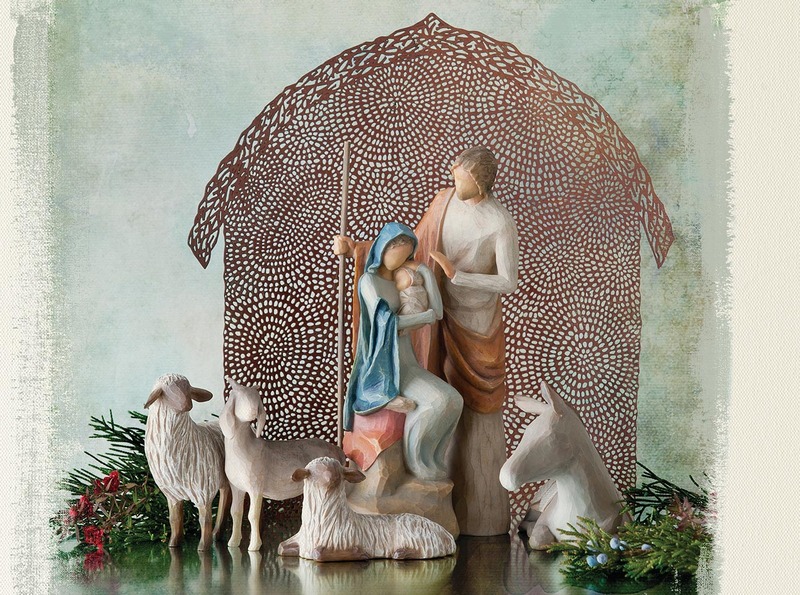 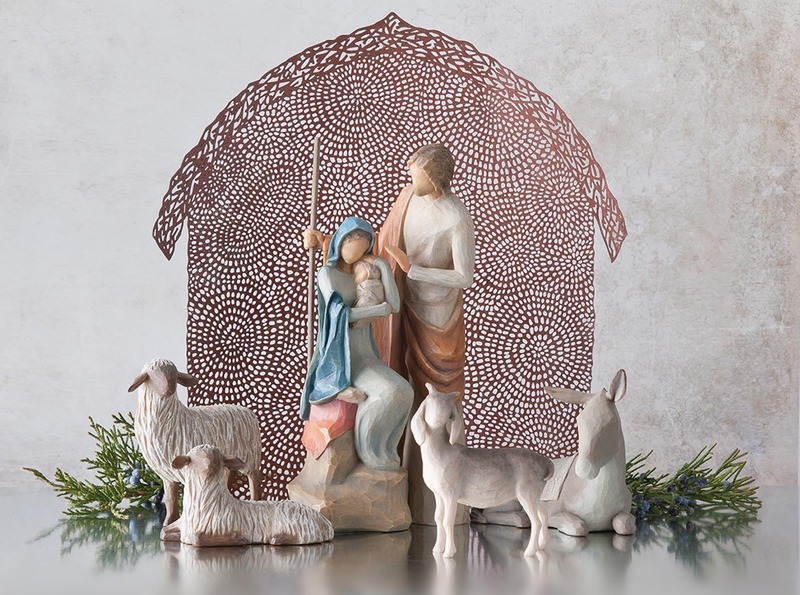 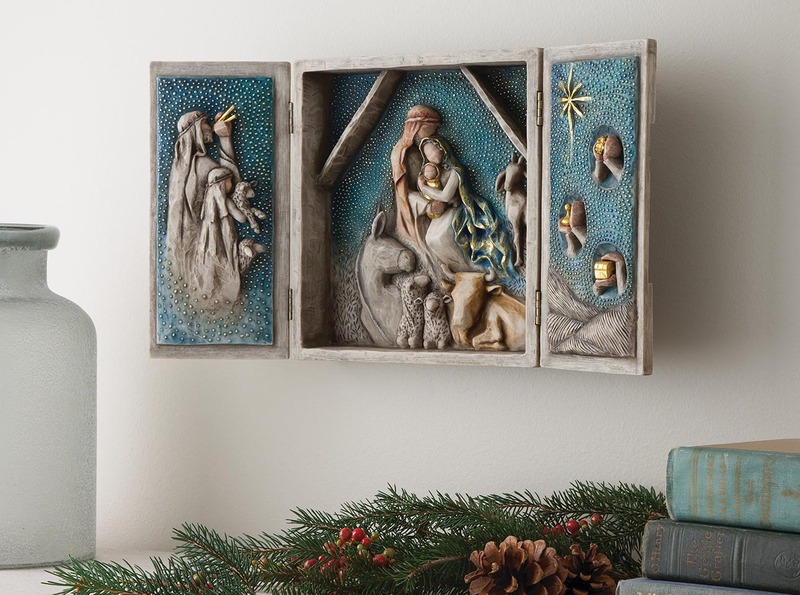 The Christmas Story large-scale nativity collection has a majestic presence. 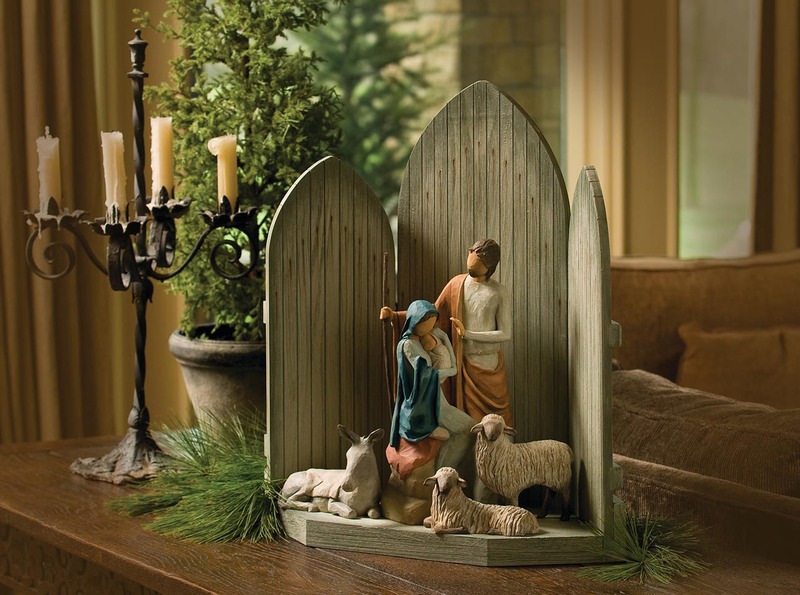 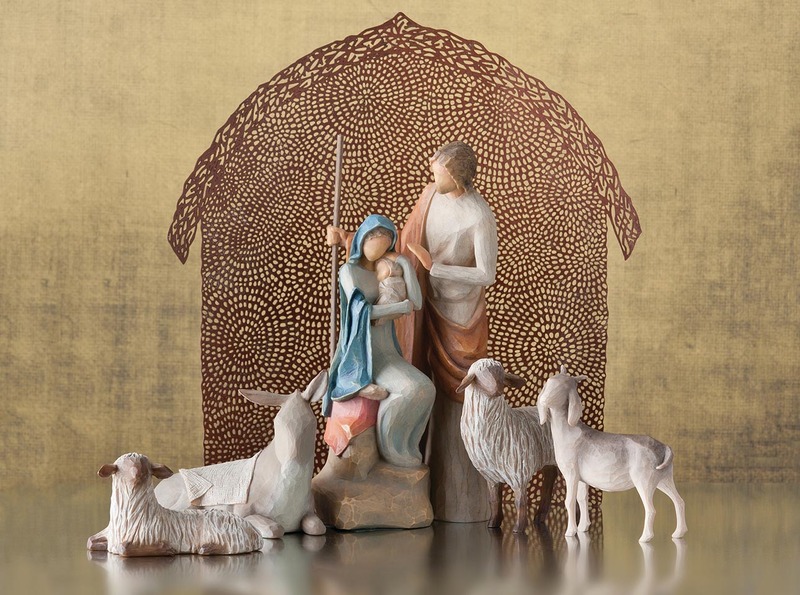 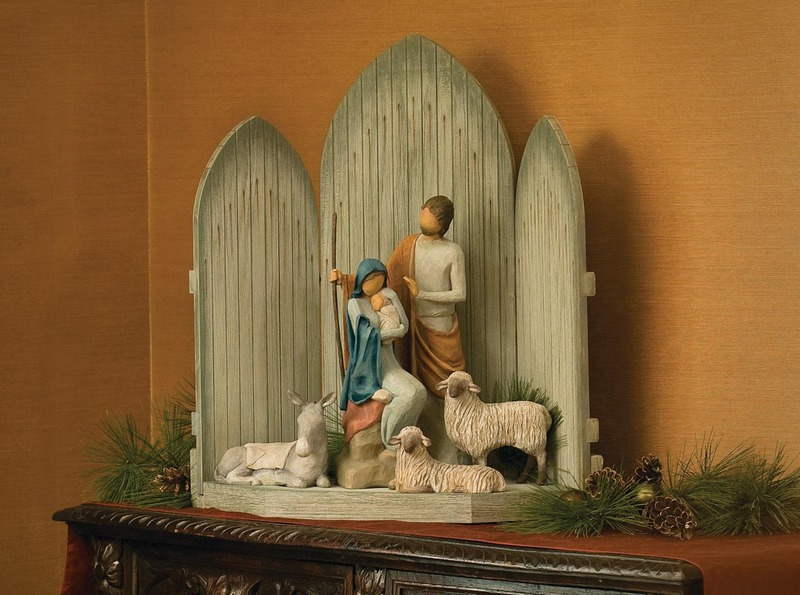 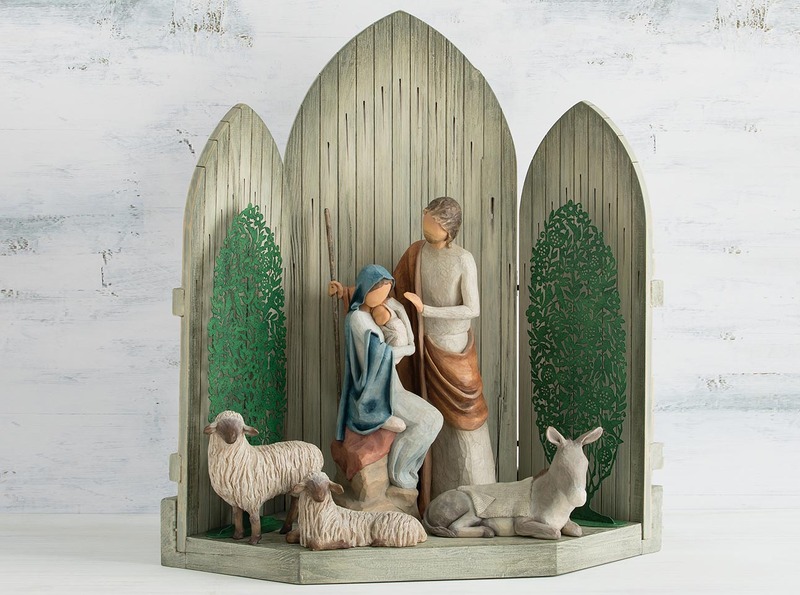 The two-piece set of Mary and Joseph fit with the three Gentle Animals of the Stable on the wood base of the 24”h Sanctuary backdrop. 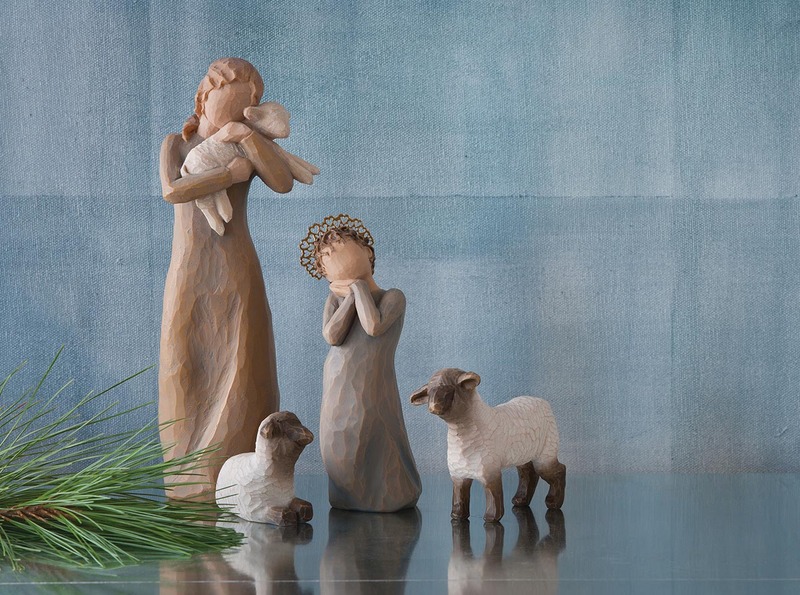 Each of the four Nativity collections has a distinct heirloom quality of great value, creating family holiday traditions and gracing homes for many seasons to come. 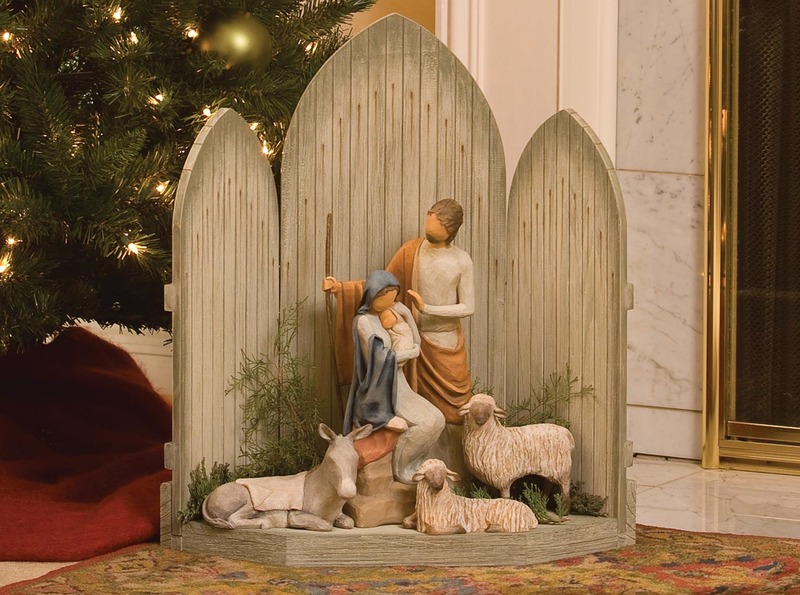 The classic Nativity provides the basis for a continuing tradition… one could start with the six-piece Nativity and Crèche, and continue to build with The Three Wisemen, Shepherd and Stable Animals, Little Shepherdess, the Zampognaro and many more pieces... it's a gift-giving opportunity for many years to come. 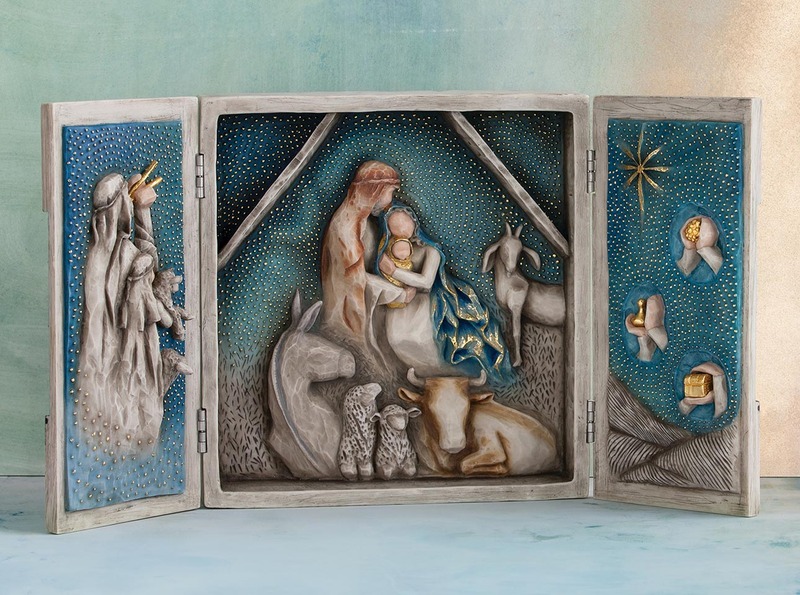 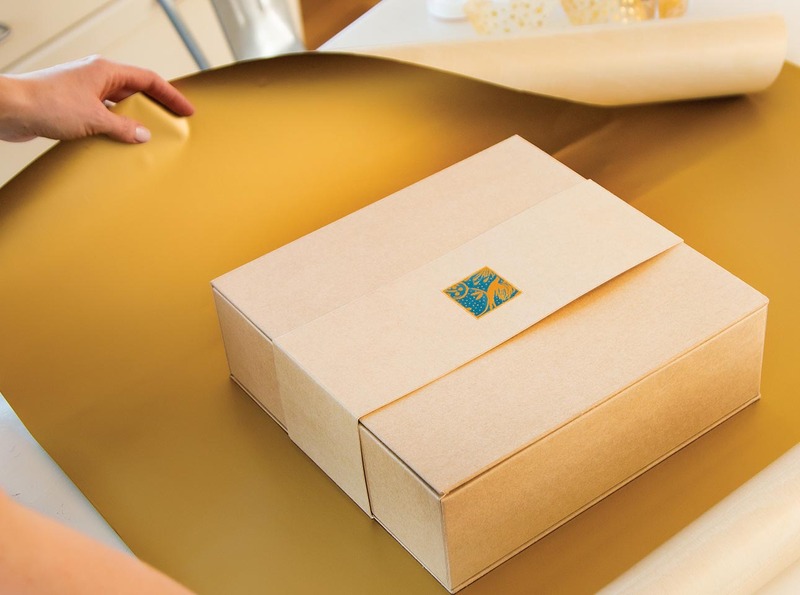 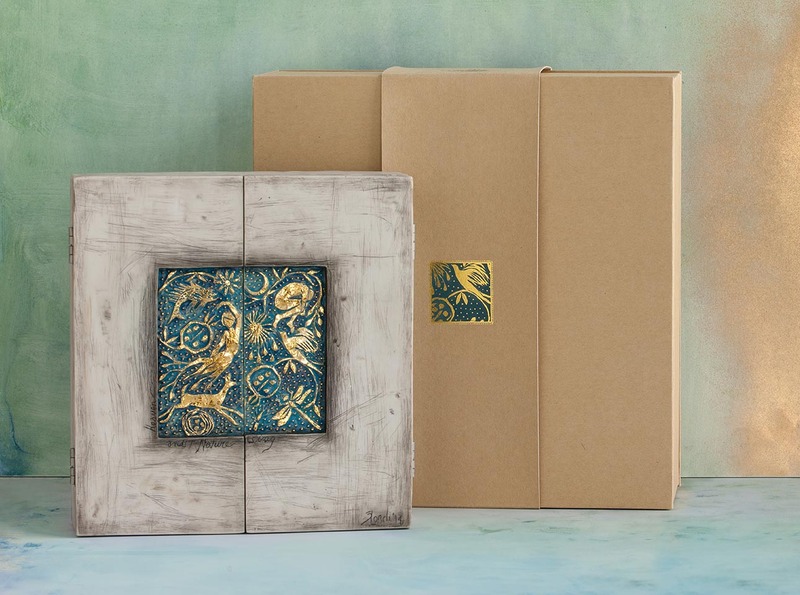 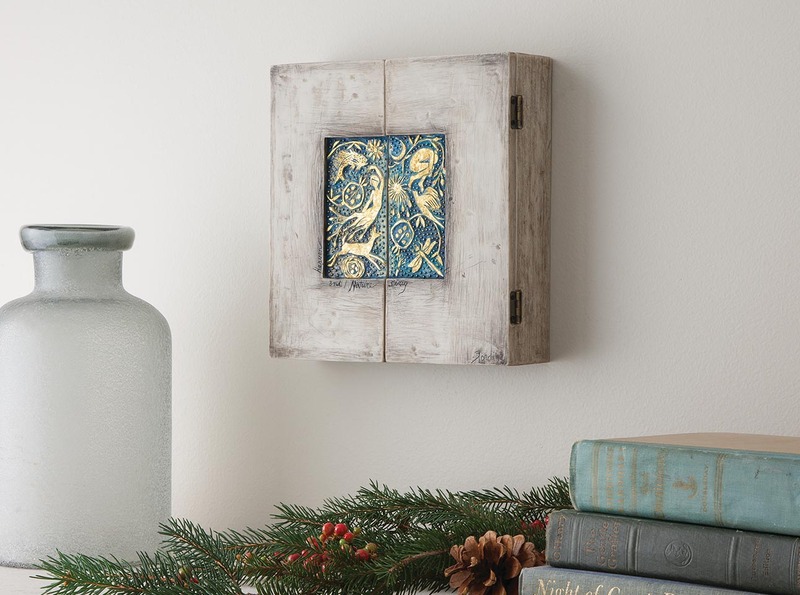 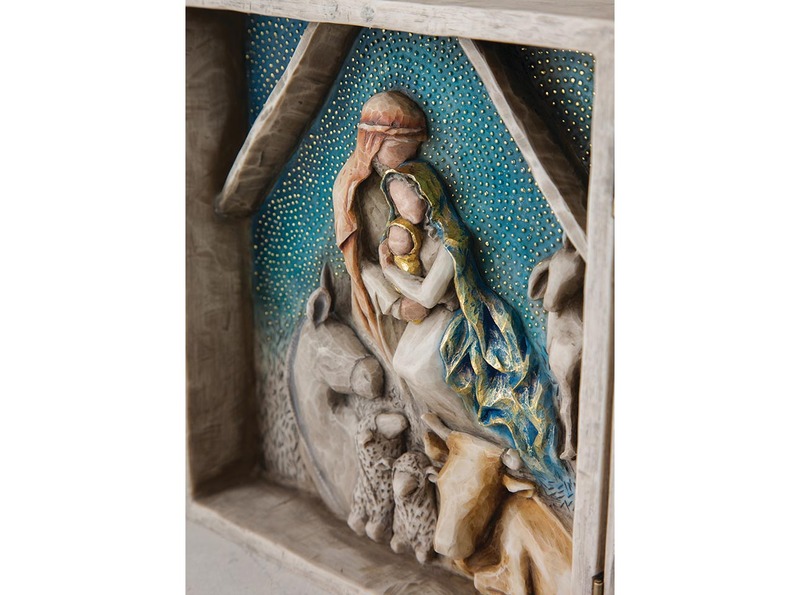 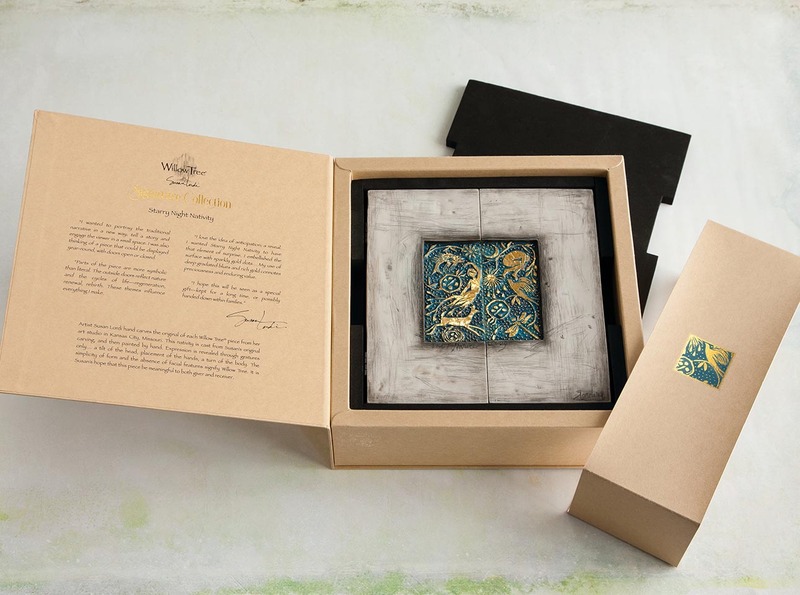 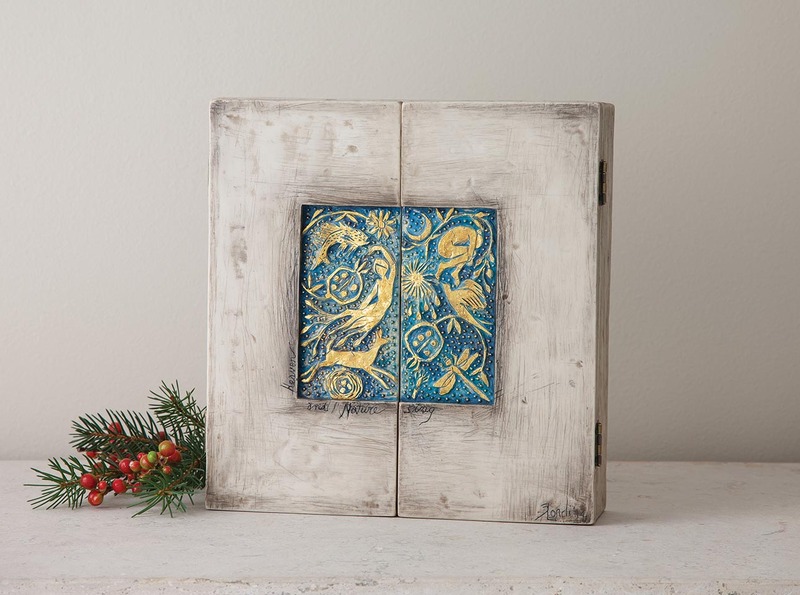 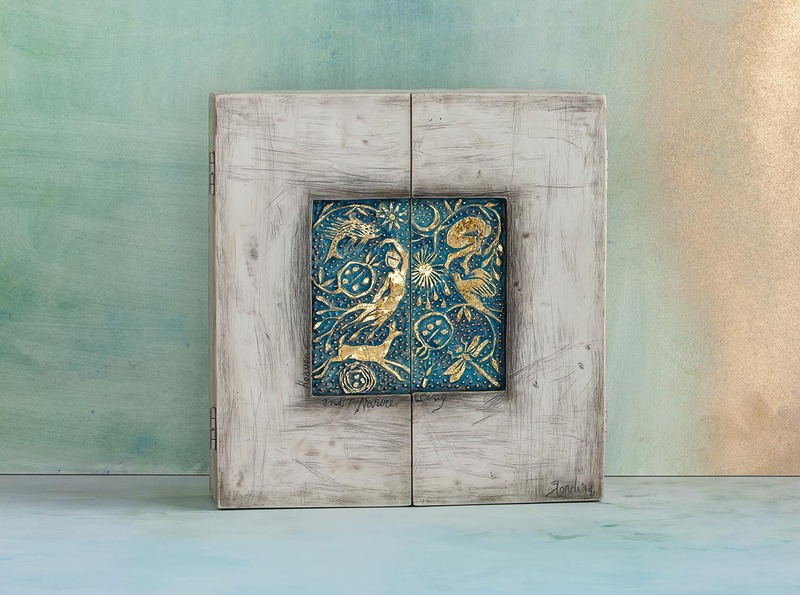 Starry Night Nativity is the entire narrative told within an 8" box, with two hinged doors revealing the Holy Family, wisemen and shepherds carved in bas relief in deep blue ombre and gold leaf. 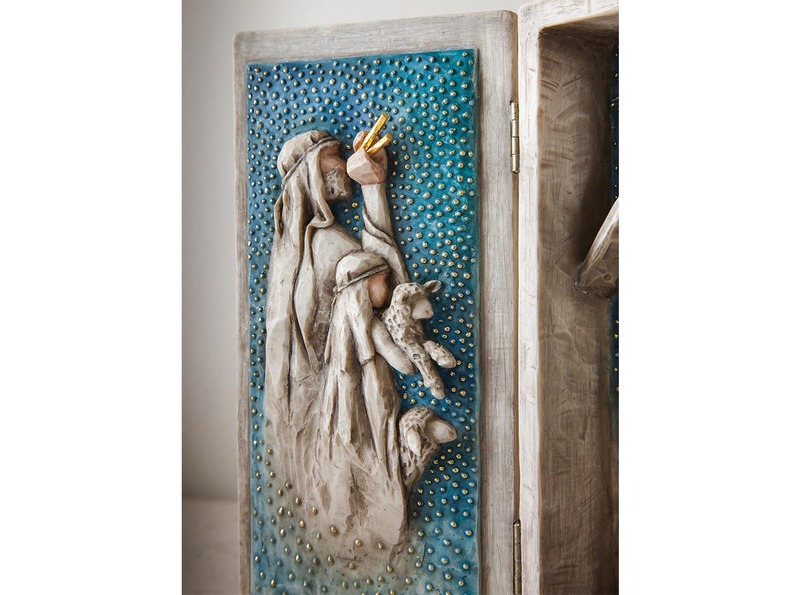 A masterful, yet intimate portrayal in a small space. 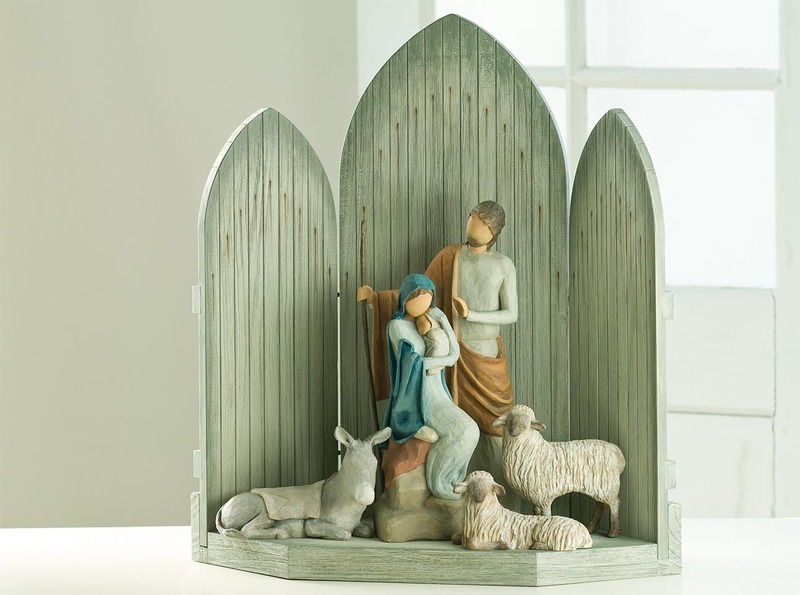 The Holy Family is another nativity for small spaces, with figural pieces as well as a set of animals and a pierced metal backdrop. 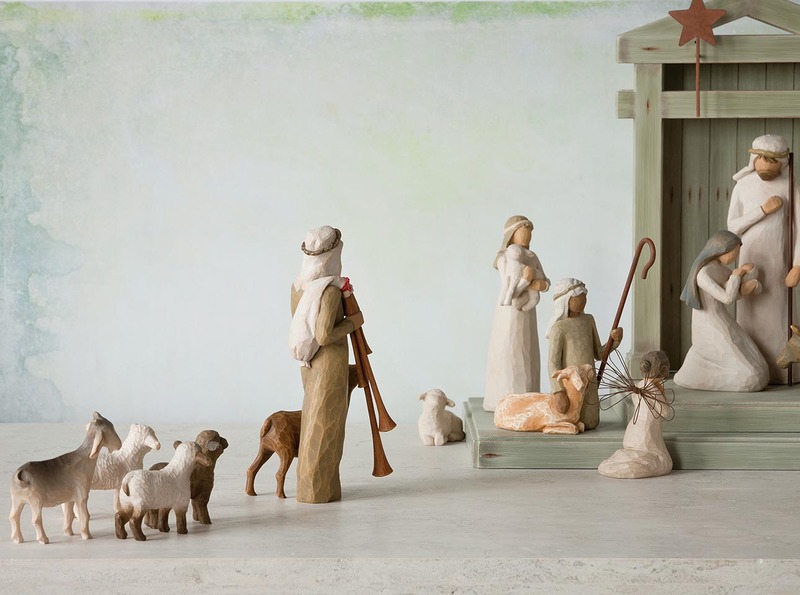 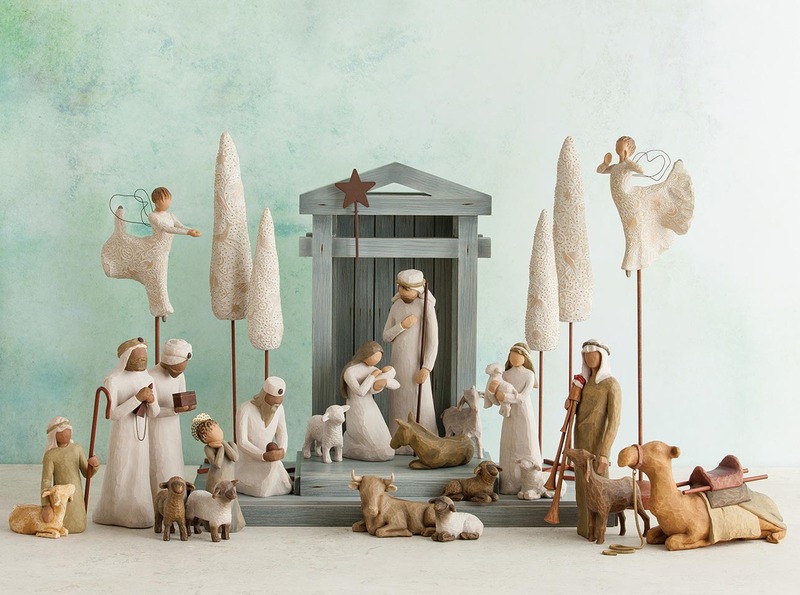 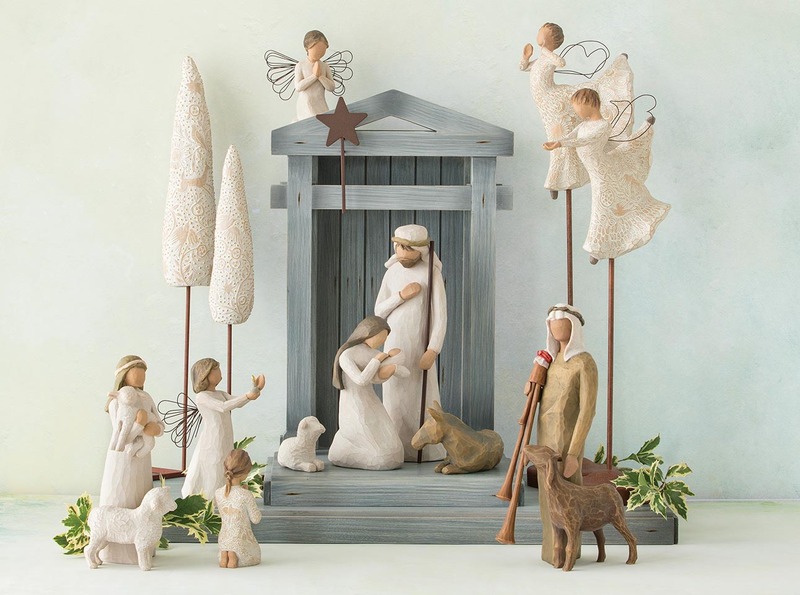 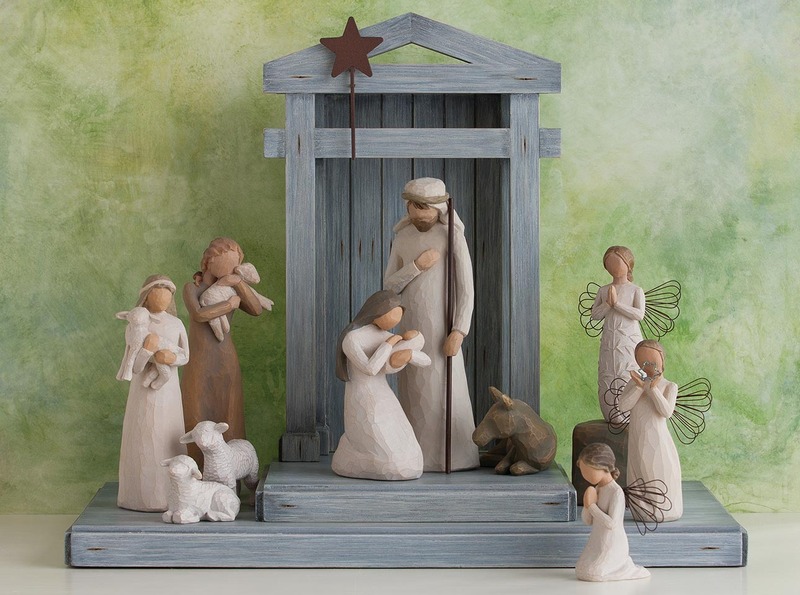 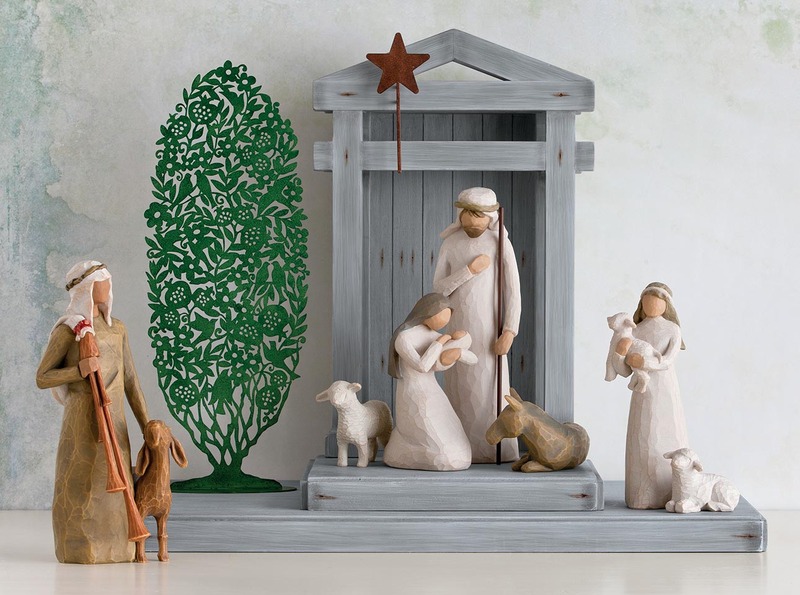 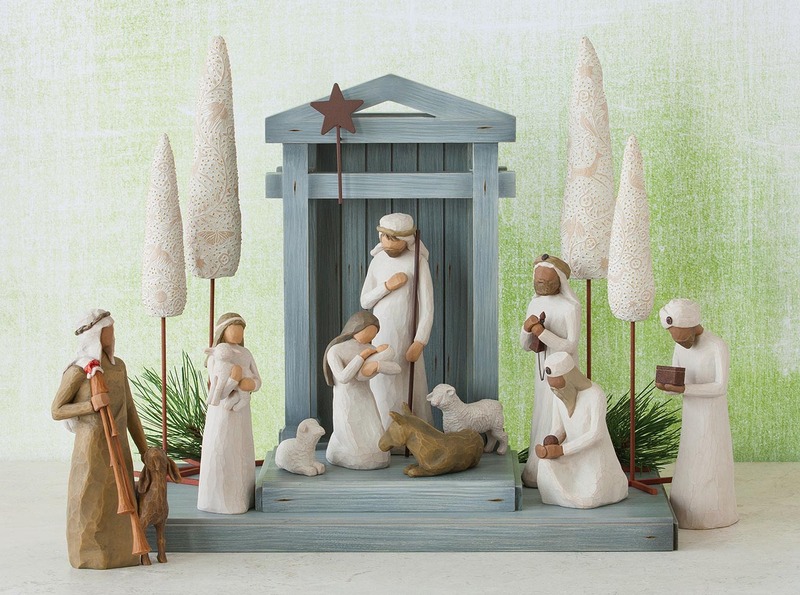 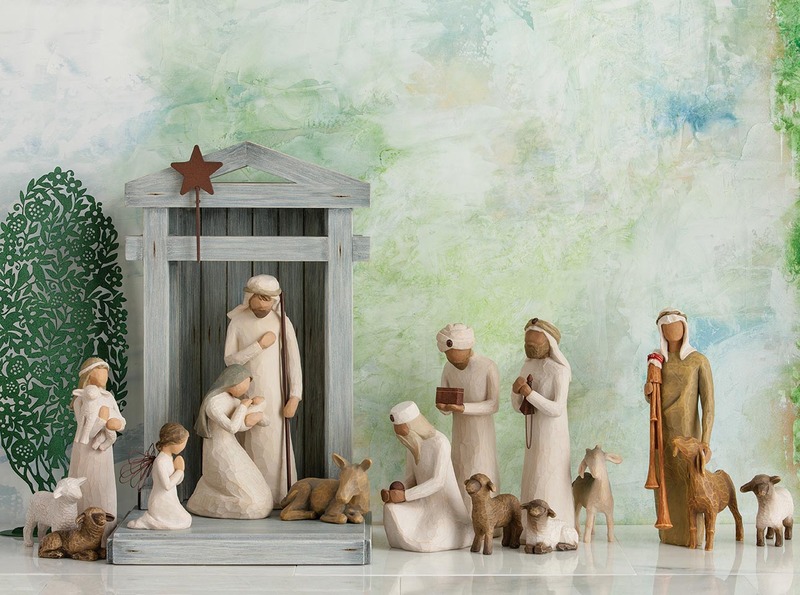 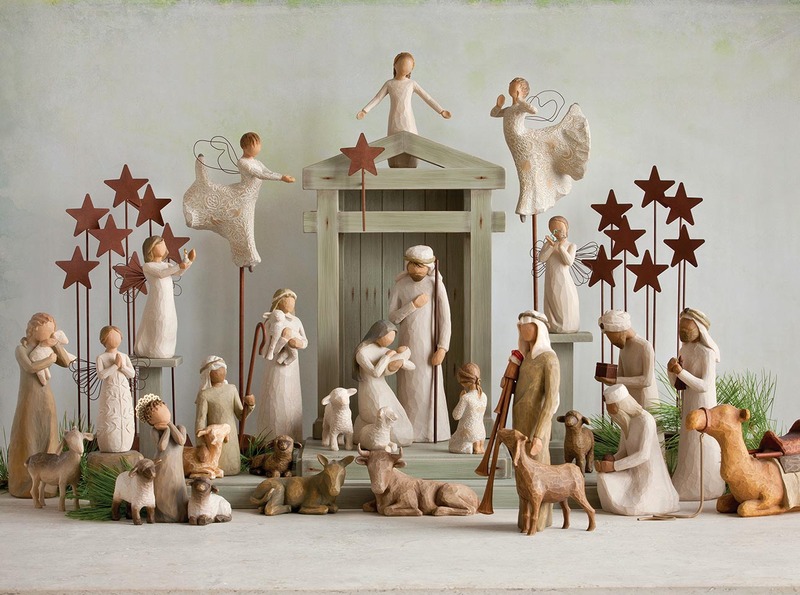 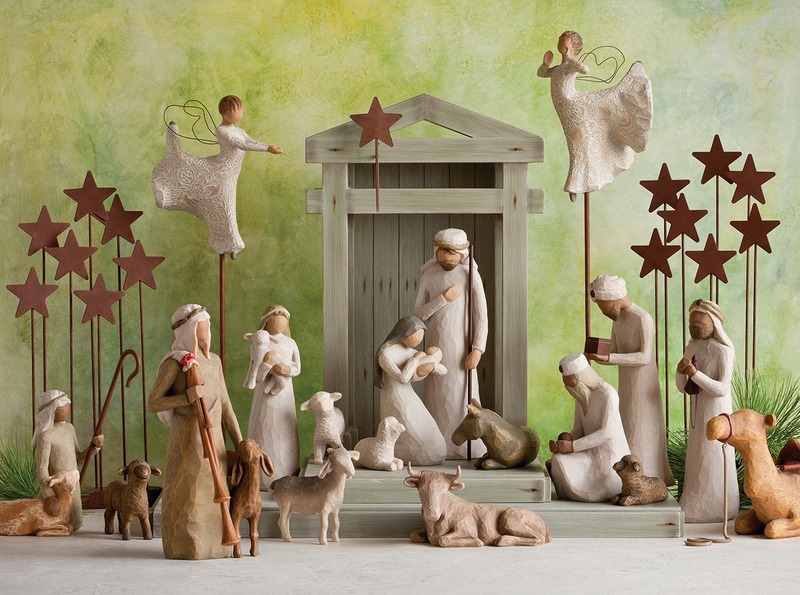 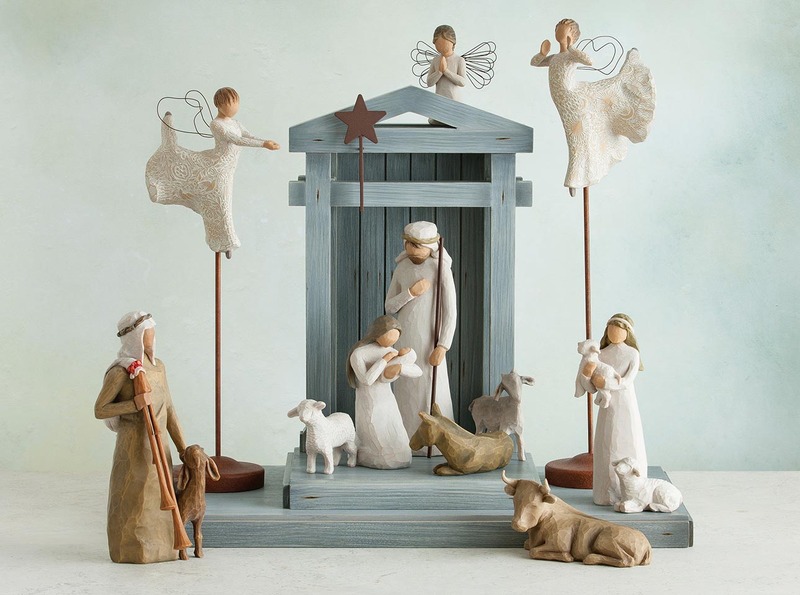 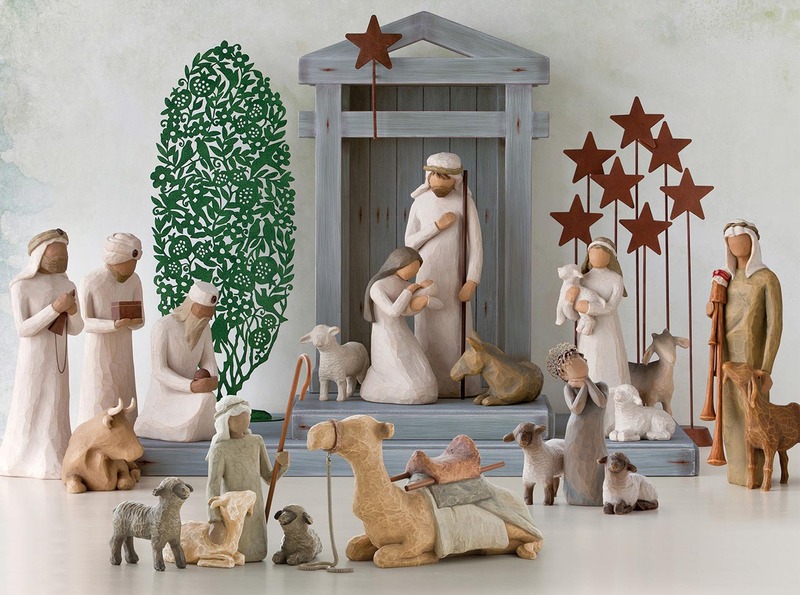 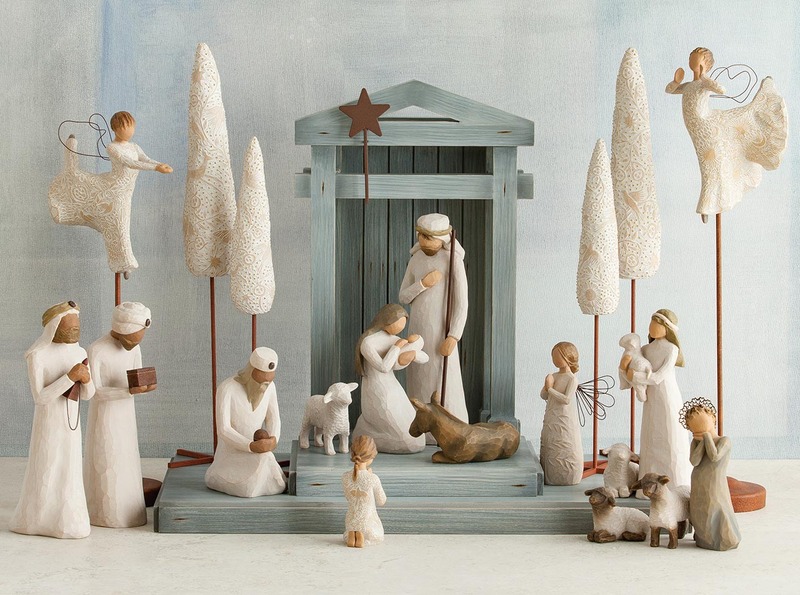 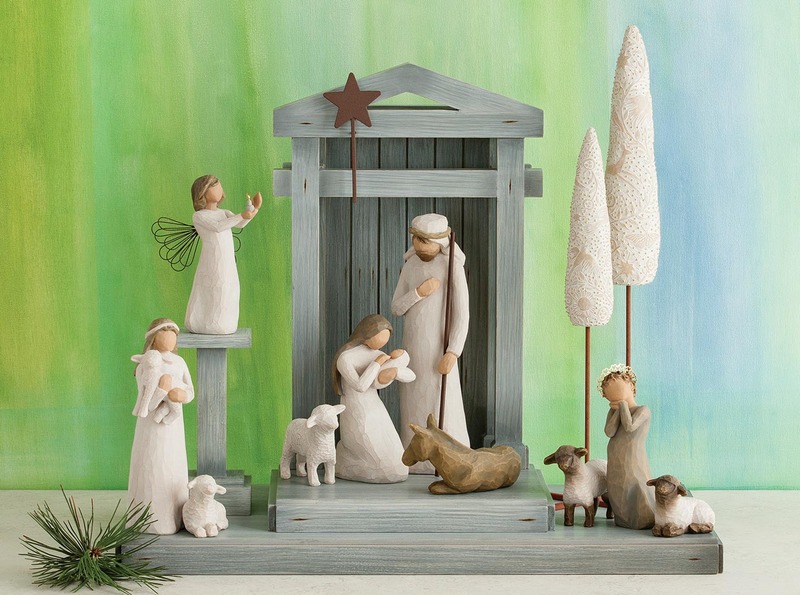 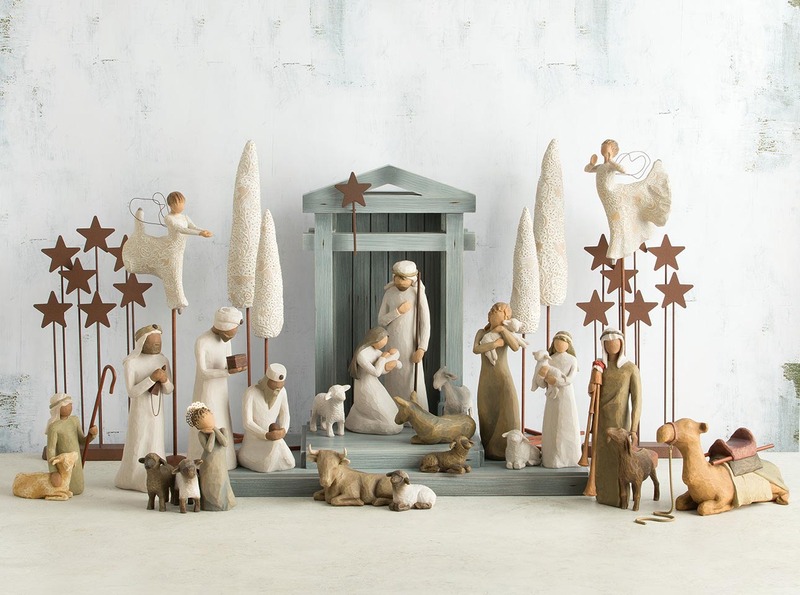 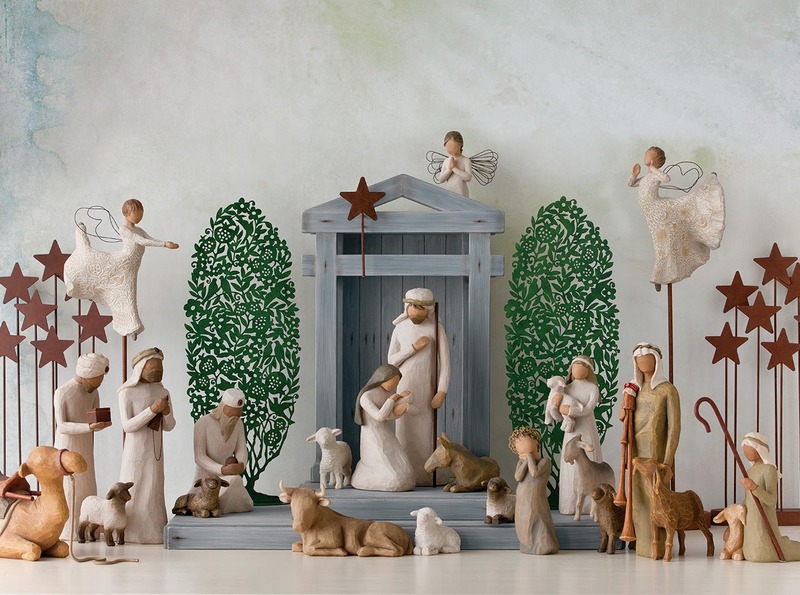 The Christmas Story is a large nativity with a majestic presence for larger homes or churches. 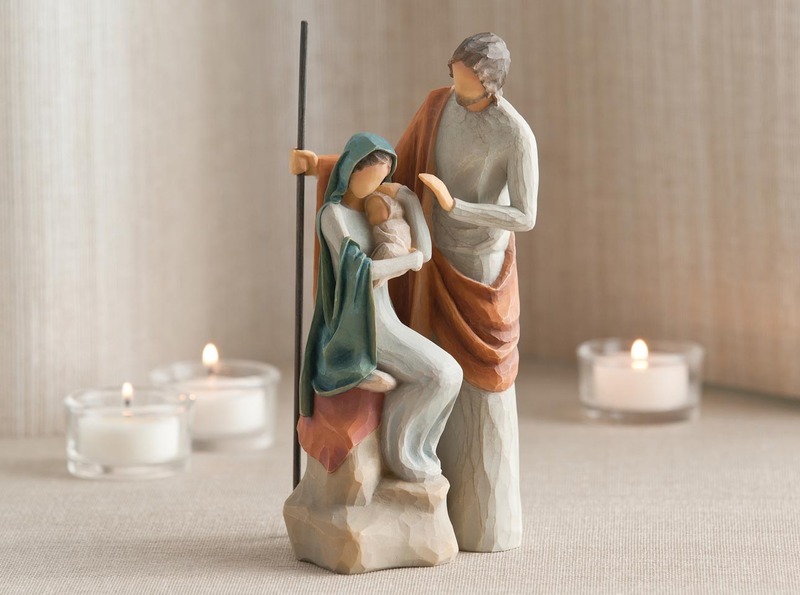 All reveal the humanity of the Holy Family through their expression and gestures.